Onioshidashi Garden (鬼押出し園) is the natural garden formed by Lava and Rock of the eruption of Mt. Asama. It is located in Gunma. In 1783, there was the huge eruption of Mt. Asama, and formed this garden. The view is also called the sea of rocks. Because it is located over 1300m high up in the mountain, there are many mountain flowers you can see every seasons. It has a great harmony of Mt. Asama, Sea of Rocks, and beautiful mountain flowers. Admission fee: 600 yen for adult, 400 yen for kids. Open: 8:00 am to 5:00 pm, close in winter. Mt. Asama is the active volcano. You will able to see smoke on the top of the mountain from Onioshidashi Garden. There are many evacuation area when the mountain erupts. The name "Onioshidashi" literary means "Ogre push off rocks." When Mt. 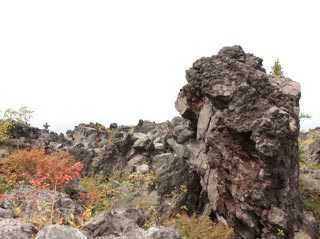 Asama erupted, people believed that Ogre push off lava and rocks. Because the altitude of Onioshidashi Garden is 1350m, the autumn leaves starts early. It is very beautiful colors with black of Lava, green of pine trees, and red of autumn leaves. In any season except winter, you can enjoy many kinds of Japanese flowers especially mountain flowers.